Kalbata, real name Ariel Tagar, is a bass music pioneer from Tel Aviv. Regardless of genre, his distinct musical approach comes through in everything he does â€“ a deep affection for the lowest of frequencies and a collection of vintage effects and instruments which guarantee his razor sharp beats will always have a warm analog feel, floating in a pool of endless ripples and echoes. Kalbata spent the naughties in east London and was a part of the city's squat party scene. His first productions fusing tuff Electro Bass and ravey Techno made their way into Dave Clark and DJ Hell's sets where he made his first mark. Witnessing first hand the beginning of Grime and Dubstep, Kalbata was taken by these new sounds, connecting the dots between his ravey start and his deep involvement with London's Reggae sound system culture. The inevitable link quickly found its way to his own productions and soon enough, his studio skills became in demand with a line of big remixes for artists such as Roll Deep, Spank Rock, Fat Freddy's Drop, Jacoozi, Sunship and more. 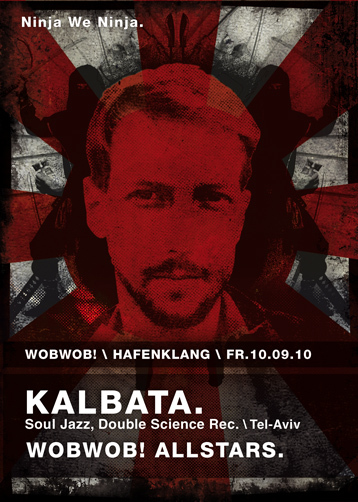 Kalbata is hitting hard in 2010 with his 3rd release on the legendary label Soul Jazz Records. A unique and true dub excursion recorded live on tape and voiced in Jamaica by Rub A Dub legends Little John and Jah Thomas. Support for this special project comes from heavyweights such as The Bug, Freq Nasty, RSD & Sinden. This year has also seen the release of Kalbata's 'Wallabee' 12" on Double Science Records - A dark garage chant featuring a brilliant remix by Cosmin TRG. In 2009, Kalbata was the man behind the mysterious "Ninja We Ninjaâ€ white label, championed by the likes of Toddla T, Benga & N-Type (who included it in his Rinse:09 mix-CD) and was recently featured on the UK film 'Shank'. Previous releases include "Shooting Rangeâ€, featuring the mighty Warrior Queen, and "Solutionâ€, featuring UK dancehall veteran Clapper Priest, both on Soul Jazz Records. His musical range, however, isnâ€™t limited to the sonic lineage of Jamaica via the UK. 2008 was a testimony to his musical diversity, with releases of two of his most intriguing side projects: The Koliphones, a dusty moog-funk project in collaboration with producers Mixmonster (of The Apples) and Kutiman (the Thru-You/deep-funk genius), gaining worldwide acclaim with their magnificent "Voyage into the Sunâ€ 12? on Melting Pot Records. Another side project, which takes a whole different route, was the deep tech-house collaboration with techno don Guy Gerber, "Akropolisâ€, released on Sven Vathâ€™s titanic Cocoon label. Releases for 2010 include an EP on Yellow Machines Records as well as remixes for Earlyman ft. Killer P & Talen ft. Lady Saw.